'Winners Take All': Generous Giving Or Phony Philanthropy? Anand Giridharadas spent time with tech entrepreneurs and affluent elites who want to change the world. But in a new book, he writes that their market-based mantras only maintain inequalities. 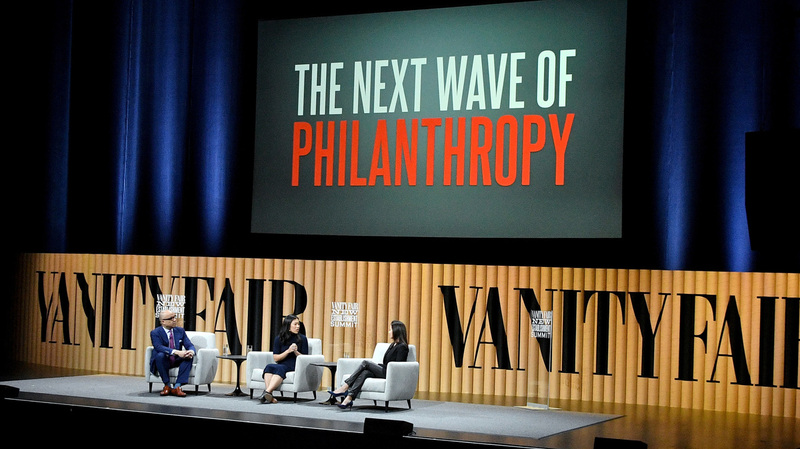 Ford Foundation President Darren Walker, Chan Zuckerberg Initiative co-founder Priscilla Chan and Goldman Sachs Foundation President Dina Powell speak during the Vanity Fair New Establishment Summit in 2016 in San Francisco. "Rich people are playing a double game," Giridharadas says. "On one hand, there's no question they're giving away more money than has ever been given away in history. Every young elite graduate wants to change the world and seeks out employers and goes to Africa to volunteer. But I also argue that we have one of the more predatory elites in history, despite that philanthropy, despite that desire to change the world." Giridharadas spent time talking with affluent elites. He argues that Internet entrepreneurs, tech innovators, even wealthy foundation directors tend to fight social problems in a way that doesn't threaten the people at the top. An Internet entrepreneur comes up with software used by Uber — a great advance for part-time drivers, except most of the profits go to the wealthy. A new app developer helps part-time workers avoid cash shortages instead of fighting for better pay. Foundations spend billions of dollars to help people in ways that really just mitigate an unfair economy; meanwhile, the wealthiest have a larger and larger share. 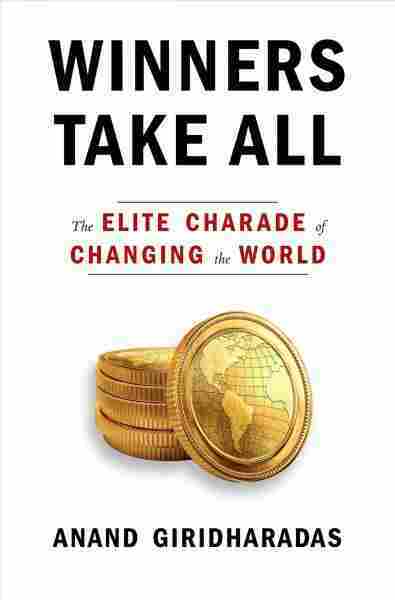 It's the case he makes in his new book Winners Take All: The Elite Charade of Changing the World. There's this idea that has taken hold in our time, which is the idea of the win-win. And win-win sounds great, right? A win-win is the idea that essentially, the winners can profit while helping other people. They can do well by doing good. Doing well by doing good has become the mantra of so many elites in our time. What this often ends up meaning in practice is that social change that offers a kickback to the winners is favored and forms of social change that don't are not. So let's take some examples. If you take the issue of empowering women — well, in theory, many, many people would be in favor of that. Well, let's get down to the brass tacks of what do we do. Well, if you look at most rich countries, things like maternity leave and universal day care and various other social policies to actually give women and families the opportunity to play all their roles seem to be what it takes. Well, what's the problem with that? It's kind of expensive for the winners. Frankly, rich people would probably have to pay higher taxes in America to empower women in that way. So what happens? Do rich people ignore that demand of women for empowerment? No, they offer a light facsimile of change. They offer a win-win change. They offer change that doesn't change anything fundamental. "Lean In" circles: Let's get women together, let's get them in a circle, let's get them to mentor each other and raise their hands. This is the kind of change the winners can get on board with — change that changes nothing fundamental, changes that keeps what they need, change that doesn't change their world. I think there's no question that we have lived on the receiving end of 40 years of dogma that government is bad and the market is good. We have been living amid market fundamentalism without necessarily realizing it. You know, it's easy to denigrate government. Let's just stop and pause and reflect on how well the United States of America functions in the spectrum of human societies out there ... even under this presidency. I am not calling for government to take over and control things. I am calling for government to stop being shamed and discredited and pushed out of the picture. Giridharadas: A lot of well-meaning liberals — and it's going to, it hurts to hear this — but a lot of well-meaning liberals paved the road for Trump. And they did so in two ways. First of all, by peddling a lot of pseudochange instead of actually fixing the American opportunity structure, instead of actually repairing the American dream over the last 30 to 40 years — by doing that, they allowed some of the biggest problems in this country to fester for decades and not be solved. And I think it's very plausible that had we actually been solving those problems of trade and education and social mobility, Donald Trump would simply not have had the oxygen that his conflagration required. But they also enabled Trump in a second way, which is: They contributed to the correct intuition, across large parts of this country, that elite Americans have rigged the game for themselves. Inskeep: You even take one further step and argue that President Trump is essentially a parody of the sort of philanthropist you don't like: "Trust me, I'm very rich. I'm going to fix this problem for you. Don't worry about it." Giridharadas: One of the most disturbing things to me in reporting this book is I started to realize that a lot of Donald Trump's language and intellectual moves, if that is not an exaggeration, actually took root in the so-called philanthro-capitalists of the last generation. So when President Trump says "only I can fix it," that idea doesn't start with him. That's actually something that has been pushed by these private-sector change agents for years [that] they are especially capable of solving social problems. When Donald Trump says, "Yeah, yeah, I manufactured stuff in China and Mexico, but that's going to help me figure out how to make sure that never happens again," again, that is a move that America's plutocrats have been making for a long time. "The arsonists are the best firefighters." Kelli Wessinger and Jessica Smith produced and edited this interview for broadcast. Patrick Jarenwattananon adapted it for the Web.